Little scratch on surface of stone. Natural Side Round White Diamonds. 22cts. Color: Purple Clarity: Clean. Ring Size: 8. Can This Ring Be Sized: (YES). Gram Weight: 2.54 Grams. It is a size M and has a 925 hallmark. Surrounded by 15 white Topaz gemstones (tested). UK size N½ US size 7. Jewellery box is for display purposes only. Band width 3 mm minimum. UK size K ¾ to L.
This beautiful ring has hallmarks for 9ct and 10ct gold. 9ct gold hallmark is 375 and 10ct gold hallmark is 417 it also has 10k on the ring band. It was bought from Gems tv. After i noticed that all the rings that i bought from Gems Tv had hallmarks for both 9ct and 10ct gold, i got in touch with gems tv to ask them why and what ct gold the rings are. Handmade in India with 925 quality silver. Band width 4 mm. Handmade in India with 925 quality silver. Band width 4.5 mm. US size 7.75. Gemstone for the month of February, March, April, December and the Zodiac sign of Pisces, Aquarius, Aries and Sagittarius. Ring Size : P. All of our jewellery is genuine whether it is to do with regards to the purity of the silver or gold we use or the authenticity of the gemstones. Handmade in India with 925 quality silver. Band width 4.5mm. US size 6.75. 925 silver chunky cut amethyst 10gr stone ring UK O-O½/UK 7.25-7.5. Gift bag. Handmade in India with 925 silver. Band width 3.5 mm minimum. 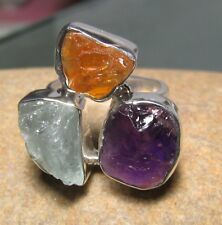 925 silver pretty cabochon AMETHYST claw setting rings. Gift bag. 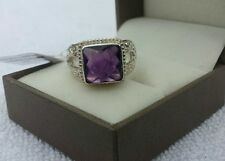 Sterling silver faceted amethyst ring, wide band UK K/US 5.25-5.5. Gift bag. The band is open, and so slightly adjustable. Band width 13. Handmade in India using 925 silver. 925 stamped. Setting height 18. US 5.25 to 5.5. m m maximum. Handmade in India with 925 quality silver. Band width 4.5 mm. 5.00 Gms.Ring size Q (US 8 ). Sterling silver chunky unisex cut amethyst ring UK N½-¾/US 7.25. Gift bag. Band width 4mm. UK size N ½-¾. Handmade in India with 925 quality silver. Gem Origin PINK SAPPHIRE. Total Gem Weight Ring Size Gold Type Gold Weight THIS RING IS RESIZABLE. We don't do that. Beautifully set in Solid 9.25 Sterling Silver Size L/M resizeable. Sterling silver triple cut AMETHYST ring UK L-L¼/US 6. Gift Bag. Band width 2 mm minimum. UK size L-L ¼. Stone size is 15 x 11mm (Inc Mount). Size: Ring band is 3.2mm wide at rear, front is 17.5mm. Jewellery Box is a small family run jeweller’s started in 2003 and based in The Historic ". Size: Ring band is 2.15mm wide, Head is 20mm x 16mm (Inc Mount) stone is 9mm x 7mm. Jewellery Box is a small family run jeweller’s started in 2003 and based in The Historic ". Rose Plated Silver Ring 4.53cts. 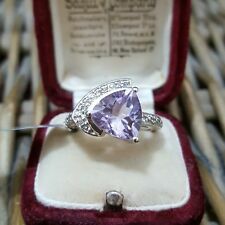 Sterling silver coiled cab AMETHYST ring UK L/US 6. UK Seller. Band width 5 mm minimum. Handmade in India with 925 silver. Strongfields The Jeweller - Member of The National Association of Jewellers This 10mm diameter natural amethyst is a beautiful mid-purple colour and has a beautiful play of light. It is securely held in a 6 claw setting which is made entirely from 9ct gold and contains a full British hallmark from Birmingham assay office. The top of the amethyst stands 8mm from the top of the finger, so this is a ring that will get noticed - for all the right reasons! You won't see this design of ring anywhere else as it is our own exclusive design. 3ct Natural Amethyst 10mm Diameter 14mm Wide 9ct Gold Mount Finger Size N (6.8 for our USA Buyers) Total Weight 3.45 Grammes Fully British Hallmarked Luxurious Packaging - Will Make Superb Gift Free Insured Delivery Our 100% Guarantee of Satisfaction. 925 Sterling Silver. The ring is a UK size S. International Ring Size Conversion Chart. NO EXCEPTIONS. ORDER BY 12pm. Be the First to Know. All our jewellery is 100% authentic, not plated or filled. Birthstone: February, March, September, December, January. The item will be glossy polished & the claws will be cut & tightly set . The laboratory certification will certify to the gemstone's authenticity only. Total Gem Weight: 925 STERLING SILVER. Ring Size Silver Weight We don't do that. FULLY RESIZABLE. Handmade in India with 925 silver. Band width 4 mm minimum. An simple design with a round faceted stone tension set into a simple silver surround. The shank is decorative with an 18ct gold ball to one shoulder and is rounded to give a comfort fit. 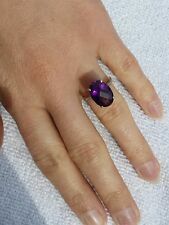 The stone is a beautiful deep purple and is a genuine gemstone. (This exquisite, handmade, gemstone ring was made from stamped 925 sterling silver and weighs 6 g. The ring band is 0.35 cm in width. All 925 sterling silver pieces of jewellery that are over 7.7 g in weight are stamped with a London Goldsmiths Assayer’s hallmark that is 0.75 mm in size and is composed of 4 symbols: the sponsor’s mark (my initials); 925; London Goldsmiths leopard’s head; and the year letter mark). ELEGANT 14K white gold plated amethyst ring with CUBIC ZIRCONIA.Size Q / 45 7/Main stone- natural amethyst Cushion cut Face of ring 22x10mmPerfect gift! Set into a silver band and setting. Band width 6 mm minimum.